GEN Income Tax has been crafted for the easy calculation of Income, self-assessment, advance tax and Interest calculation u/s 234A,234B,234C. This software doesn’t leave any room for error while filing income tax as every data is directly filed from the software no manual data entry is required. This software solution is also known as Genius software in taxation industry. GEN IT gives a facility to user to prepare & submit Income tax return in online or offline mode. It also calculates advance tax and interest u/s 234A, 234B, 234C. The software also allows users to do e-registration and provides various facilities such as submit compliance, rectification, revision of return and upload facility of defective returns. Calculation of arrear and relief u/s 89(1) and readily uploading of Form 10E. E-filing of return from various browsers as Chrome, Firefox, Internet Explorer. Gen IT gives a facility to generate form 49/49A and upload the same. The demo video of using Genius income tax e-filing software consists of complete procedure of using the software. It is bonded with verbal communication to make user understand all the features and possibilities of the same. 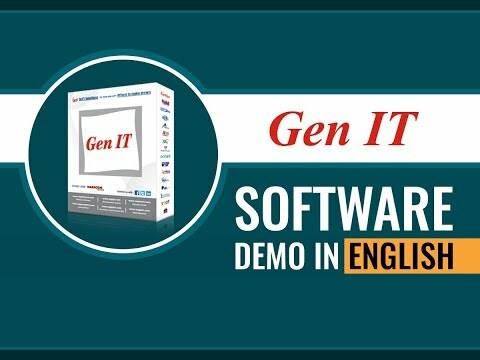 For better understandability, the demonstration is made in English language, which will be comfortable for people with non regional mother tongue. Q. What is the period for which a person's income is taken into account for purpose of Income tax? Q. Who is supposed to pay Income Tax? Any Individual or group of Individual or artificial bodies who/which have earned income during the previous years are required to pay Income tax on it. The IT Act recognizes the earners of income under seven  categories. Each category is called a Status. These are Individuals, Hindu Undivided Family [HUF], Association of Persons [AOP], Body of individuals [BOI], Firms, Companies, Local authority, artificial juridical person. When Companies pay taxes under the Income tax Act it is called corporate tax. Q. Is Income tax Act applicable only to residents? No, The Income tax Act applies to all persons who earn income in India. Whether they are resident or non-resident. Q. Whether the software is capable to calculate the deduction u/s 80G where the qualifying limit is applicable? Yes. It calculates the limit automatically and gives you the exempted and taxable amount in computation. Q. Is there any provision about the MAT calculation in case of company assessee? Yes. Through the software MAT (Minimum alternative tax) u/s 115 JB is automatically calculated.